This summer I took my family on a trip to the Highlands. Not a whiskytrip but a familyholiday this time. 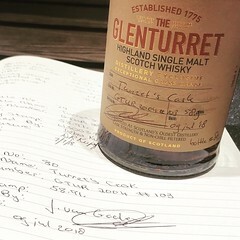 Of course I did my homework and that's how I knew about a new handfill bottling at the Glenturret distillery. 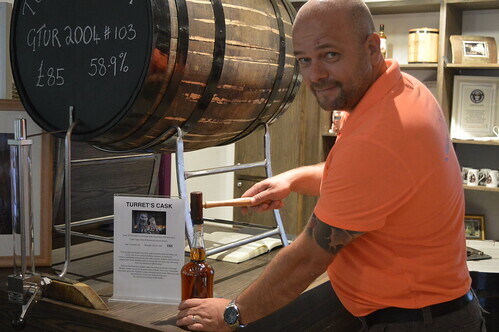 When I visited this distillery with Peter in 2016 we both filled a bottle from the Gerard Butler cask. 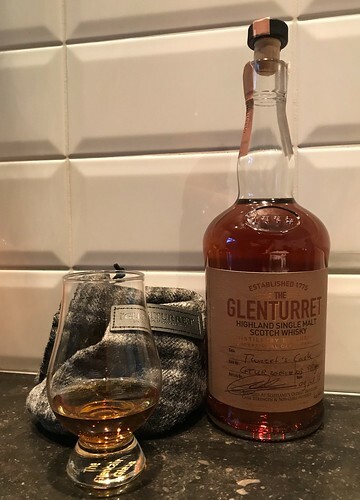 Now Turret, one of the distillery cats, has a cask named after him and well, being in the neighborhood, I wouldn't mind having another handfilled Glenturret in my collection. A daytrip from our cottage in Killin to Perth brought us past Crieff and the lovely distillery. My first handfill Glenturret bottle has a special destination. This one is the first bottle of a small collection I'll build for my youngest son. My oldest son has a handfill Glendronach to start his collection with. They will get their bottles at their 25th birthday so these bottles will remain closed for quite some years. The new bottle will be opened now but first it had to be filled (by me). We arrived at the distllery just after 10AM. A nice time for a cup of coffee so we went to the restaurant in the visitor center. Then my oldest son and I walked down the stairs to enter the distillery shop. It's Always nice to have a personal photographer with me on these visits. There it was, Turret's Cask, patiently waiting for me to fill my bottle. It's a very nice experience to fill a bottle an sign the label and the tax-book. It's even better when the whisky has a very nice quality as well. The bottle is opened now so it's time to review the whisky. Distillation took place in March 2004. This means that the whisky has matured for 14 years in a First Fill American Oak sherry cask. No colour was added, no chillfiltration was used and of course, it's bottled at cask strength with an ABV of 58,9%. Let's have a dram then! Finish: Nice length and taste with bitter notes of dark chocolate combined with the fruity taste of ripe banana and cherries. Both the American Oak and the sherry histroy of the cask have had their influence of this very nice whisky! Welcome to my collection Turret!